Once upon a time, the entire Mur River valley formed a long line of heavily industrialised towns and the region was striving with a well-developed iron industry. Today, Styria′s industrial core is one of the economically most troubled areas of Austria, but the history of mining and the industries involved adds an interesting aspect to a well-rounded sightseeing tour across Austria. It is best explored in the towns of Eisenerz and Leoben. The centre of the mining is the area around the iron ore mountain of Mount Erzberg. Centuries of quarrying and mining have cut the mountain into a bizarre sight, something resembling a Mexican pyramid rather than a mountain. Mining is still in progress, but you can do tours at the site or go on the narrow-gauge railway that was once built to transport the ore from the village of Eisenerz to Leoben. 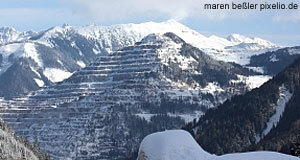 "Eisenerz" literally means "iron ore" and is a not-so-subtle reference to the reason for the village′s very existence. This is where iron ore was quarried ever since Celtic and Roman days, and ore from this place fed the Habsburg′s growing empire with its demand for armour and tools throughout the centuries. Actual mining stopped only some 25 years ago, but the open-cast quarries are still being used. Some of the former tunnels are used as show-mines today. This rather pricey "Schaubergwerk" tour accommodates primarily domestic visitors, international tourists have to attend a German-speaking tour, but leaflets in other languages are available. An interesting display of mining-stuff can be seen after entering the mountain through an enormous tunnel that is spiralling its way into the Erzberg to connect the mines from different levels. One display also tells the legend about how the iron ore here was discovered, a story that every child in Austria knows: Once upon a time, three young men were walking through the woods. At one point, they suddenly discovered an Aquarius trapped in fish cage. He begged the men for mercy and offered to fulfil them a wish each if they set him free. Since that sounded like a good deal, the young men did set the Aquarius free and the Aquarius said what he had to offer: Gold for a short amount of time, silver for a few years or iron forever. The first one went off with the gold, had a few glorious moments with women and wine and died as a happy man shortly thereafter. The second one opted for silver, became prosperous and supported his family until he eventually ran out of the money and had to go back to working. The third one, however, went for the long-term investment and asked for the iron. So the Aquarius led him to the Erzberg, back than an immaculate piece of natural landscape, and told him to start a mine here. So he did and ever since then, iron ore from the Erzberg feeds the iron and steel industries of the country. But wait, there′s more: If the show mine hasn′t satisfied all your sightseeing needs yet, continue with the extensive Stadtmuseum in Eisenerz. It will tell you everything you ever wanted to know about Styrian iron industries plus many things you wouldn′t care about. It is situated in the Kammerhof, the former administrative headquarter of the state-owned mines. The building became a hunting lodge to Emperor Franz Joseph I in 1880, but today it is stuffed with interesting bits and pieces on mining traditions, folk culture and history. Highly recommended for any well-rounded trip to the area. Continue with "Eisenerz, Leoben & Göss - Part II"